NEW YORK -- Republican presidential candidate Ted Cruz said Tuesday that surveillance in Muslim neighborhoods in the U.S. must be intensified following the deadly bombings at Brussels, while rival Donald Trump suggested torturing a suspect in last year's Paris attacks would have prevented the carnage. Echoing Trump's earlier statements, Cruz said the U.S. should stop the flow of refugees from countries where the Islamic State militant group has a significant presence. The Islamic State took credit for the attacks at the Brussels airport and a subway station that killed dozens Tuesday and wounded many more. "We need to empower law enforcement to patrol and secure Muslim neighborhoods before they become radicalized," the Texas senator said in a statement. Trump praised Cruz's plan as a "good idea" that he supports "100 percent" in an interview with CNN. The GOP front-runner also intensified his past calls for the U.S. to engage in harsher interrogation techniques, arguing that Belgium could have prevented the bombings had it tortured a suspect in last year's Paris attacks who was arrested last week. "Well, you know, he may be talking, but he'll talk a lot faster with the torture. ... Because he probably knew about it. I would be willing to bet that he knew about this bombing that took place today," Trump said. Trump, who has proposed a temporary ban on foreign Muslims entering the U.S., said "nothing's nice" about techniques such as waterboarding, which simulates drowning. He added, "It's your minimal form of torture. We can't waterboard and they can chop off heads." Rep. Adam Schiff of California, the top Democrat on the House Intelligence Committee, said earlier Tuesday the Brussels plot was probably already underway before the suspect's arrest and that his apprehension may have sped up its execution. When reminded that international law prohibits torture, Trump responded: "Well, I would say that the eggheads that came up with this international law should turn on their television and watch CNN right now, because I'm looking at scenes on CNN right now as I'm speaking to you that are absolutely atrocious." "New Yorkers want a safe and secure America," Cruz said. "New Yorkers saw first-hand the tragic consequences of radical Islamic terrorism." Trump said the city had had "the finest surveillance of the whole radical Islam situation that there is." He joined Cruz in blaming the city's mayor, Bill de Blasio, for ending it. "He took it down and he knocked it out and that was a terrible mistake," said Trump, adding, "We can be nice about it and we can be politically correct about it, but we're being fools, OK?" 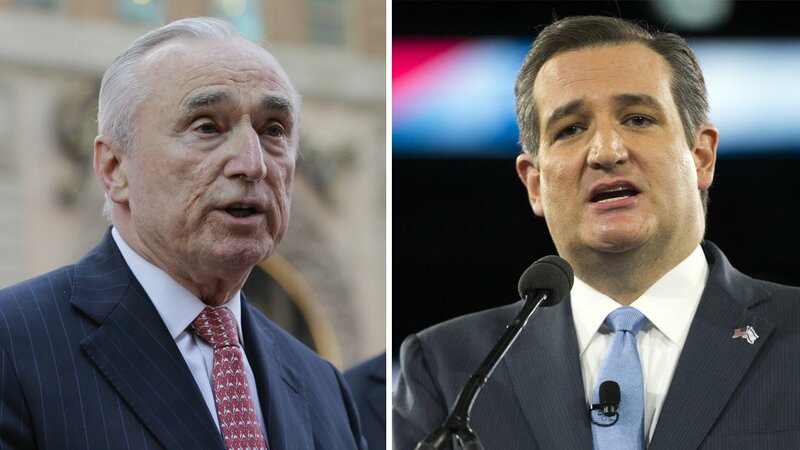 New York Police Department Commissioner William Bratton objected to Cruz's remarks Tuesday, saying: "I take great offense at his characterization of that whole population. ... He's really out of line." The Council on American-Islamic Relations, the nation's largest Muslim civil rights and advocacy organization, condemned the calls for surveillance, saying it sends "an alarming message to American Muslims who increasingly fear for their future in this nation and to all Americans who value the Constitution and religious liberties." Democratic hopeful Bernie Sanders, campaigning in Arizona on Tuesday, said boosting national security and protecting civil rights must go hand-in-hand. He said he strongly disagrees with calls for heightened domestic surveillance of Muslims. "That would be unconstitutional - it would be wrong," Sanders said. Imam Abdisalam Adam, the board chair of Dar Al-Hijrah Riverside Islamic Center, a mosque in a Somali neighborhood in Minneapolis, said putting more scrutiny on Muslim communities is not a way to keep the country safe. "It's counterproductive," he said. "When you look at the American Muslim community, it's very well integrated and very involved in civic unification ... It's a patriotic community that's involved in so many aspects of the American life." Asked about Cruz's comment, none of a half-dozen conservative House Republicans meeting with reporters Tuesday criticized him and most spoke of the need to keep the country safe. "Nearly every neighborhood is patrolled. That's what local law enforcement does," said Rep. Tim Huelskamp, R-Kan., who has endorsed Cruz. He added that he didn't know specifically what Cruz was referring to. "I believe in the First Amendment, the Second Amendment, every one of them, but we also know that in this country, we're going to have to step up security in every neighborhood across America," said Rep. Matt Salmon, an Arizona Republican who has endorsed Cruz.